We’re wrapping up our activities in Bonita Springs. We’ve had a great time in Southwest Florida but it’s time to move on. We had never stayed in one park for two whole months before unless we were hanging around our kids or Terry’s folks. This was a first and it’s been a mighty long time. We only have a few more days left before we start heading north .. a little bit at a time. After all, we still have Harry Potter World to visit before we start heading west again. When we arrived here the first of December, the weather was unseasonably hot and humid. We dared not leave our RV without soaking ourselves in bug spray. For some reason the bugs love to bite me. When January rolled around the bugs pretty much went away … well, mostly. At least they aren’t as vicious but it’s probably because the weather has changed. We’ve had some nice days but we’ve also had plenty of rain, wind and storms too. We’ve gone from dressing for warm weather to not having a clue how to dress. On top of that the traffic has changed in a month. Throngs of snowbirds from Canada and the northern US ascended on Southwest Florida. Traffic lights are long and the lines encompass blocks of vehicles. We’ve learned if we want to eat out the only time to go is during Happy Hour. It’s not only because prices are greatly reduced but it’s also because the restaurants fill up during regular dinner hour. You’ve all heard the song, “Grandma Got Run Over By a Reindeer.” Well, Jerry got run over by a golf cart! That’s right. Golfing is dangerous and it isn’t just the golf balls that hurt. Golf carts are dangerous too and especially when elderly gentlemen accelerate into someone in front of them. Oops! The elderly gentleman ran over Jerry. Well, Jerry’’s swollen but at least on the mend. The manatees finally started arriving in the river that runs through our RV park. We’d been told we’d start seeing them move up the Imperial River in January. That we did. Right now they are underneath the entrance to the park by the bridge. It was hard to get a few good pictures with the reflection but this is as good as it got for this photo opp. Ever hear of Sheepshead fish? I certainly hadn’t until I saw three guys cleaning them at the fish station in our park. They had been fishing in the Gulf and brought back a whole slew to clean. Interesting to watch them clean but not much “meat” on the little fish. The most exciting thing this week was walking the beach and finding hundreds of conch shells. 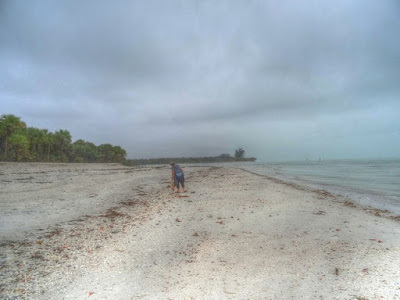 We had been to Sanibel and we had been to several beaches looking for shells and had found a few but not a lot to brag a lot. Then, we had a mighty storm come through. The Hintons discovered shells at Barefoot Beach and the next morning Janice and I were out there to check it out ourselves. It was early and it was raining but we were on a mission and the mission was a huge success. The beach was beautiful. We were there several hours. The fog rolled in and out. Clouds changed and colors changed too. At times they were threatening and at other times they just opened up and rained. There were also periods of no rain and then heavy rain but we were determined. The beach was empty and that was eerie. It was just after low tide when we arrived at our first location on the beach. We thought the collection of shells along the beach was amazing but it was nothing like the tremendous find of conch shells we discovered when we changed location. There was another path to the beach farther down. The path was about 3/4 mile long and slippery and wet. We came out on a beach loaded with conch shells … just loaded with them. There were more than either of us had ever seen. Many of the shells were live so we left them to be swept back into the ocean when high tide rolled around again. There were also many, many empty shells. Our bags were so full of shells that they were heavy. We had gone Conch Crazy. We were sopped but what a tremendous adventure collecting all these beautiful shells. Amazing for sure. One day wasn’t enough. We want to go back but thunderstorms have rolled in. If we can, we’ll try another conch adventure and this time Terry and Jerry want to go with us. ‘Tis life on the road …. or, at the beach. We've been coming to these beaches for 40+ years and I have never seen this, actually there are more here than Sanibel right now. We are awe struck! Those are some really awesome pictures of the sea and sky. What are you going to do with all your shells? Somehow seashells always end up on the back of the toilet but RV toilets don't have backs. Oh no, what shall you do? Great pics and a good find with the conch shells. We have been to Florida in the fall a few times and sure don't want to be there when the snowbirds arrive. looks like you have been there and done that now. 2 months in one place is hard for us too. That is a nice area. Bonita Springs was the first place we stayed for more than a week when we were full timing. We ended up a month there the first time and the second year we spent two months there. Glad that the bugs have gone away, hope the weather improves as well. What ever will you do with all those shells? Great pics of the beautiful beaches. It looks so pretty with lots of shells on it. I would love to respond to you via email but I don't have your email! Oh my gosh. Poor Jerry. You have to watch out for those aggressive elderly golf drivers! Never heard of Sheepshead fish either. The conch shells are awesome. What are y'all going to do with them? I hope Jerry is mending well. Not sure why I thought candles when I saw those shells but I did. What do you have planned for them? I LOVE the beach but sky in your photos steal the show! I'm with Jodee, do you have a project to use the shells for? Amazing amounts of shells indeed! Don't have them up here.